Using quinoa instead of pasta in soup is a great way to introduce more protein. My kids will eat quinoa when it is in soup but not when I serve it in a salad. I think the texture works better for them when it is swimming around. For those of you who are trying to avoid pasta – this is a great combination that will remind you of a minestrone or other pasta filled soup – and you won’t mind that the pasta is missing because you replaced it with a whole grain. This time of year, I like to make huge batches of soup and store them in the fridge for the week. This soup improves with age – just like me! Have you tried substituting quinoa for pasta? What do you think? Place onion, celery, carrots, garlic, and olive oil in a microwave-s safe bowl. Microwave on high for 2 minutes stir and repeat until the onions have softened. 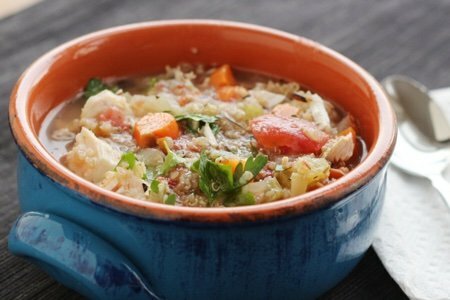 Place mixture into slow cooker with chicken, quinoa, tomatoes with juice, red pepper, Italian seasoning, oregagno, and chicken broth. Cook on high for 3-4 hours until quinoa is cooked. Take out chicken, chop, and put back in soup. Garnish with parsley and Parmesan cheese. I love quinoa! I eat it mixed with homemade quac and also in my scrambled eggs for breakfast. Sounds good to me. I love to eat soup to help fill me up with dinner..It satisfies me and I eat less of the main meal. Plus I just bought a pressure cooker and it makes wonderful soup. Your soup looks amazing! I can spend hours and hours looking at recipes on-line, always pausing the longest on soups or other one-pot meals. I have tried quinoa, a couple of times, but so far I'm not a huge fan. I WANT to like it for health reasons, both my adult kids like and cook quinoa, but when I make it, it tastes too earthy. Am I doing something wrong? Maybe not rinsing it enough? Does anyone else have this problem? I make a soup very similar to yours with just a few differences: I use a pound of mushrooms instead of chicken, stewed tomatoes-blendered instead of fire-roasted, addition of 1 big bay leaf, and barley instead of quinoa. Simmered for 1-1/2 to 2 hours on a Sunday; I freeze most of it for a month of weekly meals to make living alone a breeze. Plus my pop-in kids love it. As far as my tummy is concerned about 2 cups is a complete dinner with a slice of buttered sour dough bread [my new love]. My husband doesn't care for quinoa - hard to break the taste buds of a meat-&-potatoes country boy! But he DOES like my homemade soups, so I'll try adding quinoa, since the WW points are low for this recipe (though they'd be even lower without quinoa!). I'm not a fan of Italian favors or heat, so would substitute my preferred seasoning, skip the pepper flakes, add more fresh veggies (softened on stove with no-SP spray, rather than in microwave), and pitch everything into the crockpot. Soups are easy, nutritious, & filling, but lack 'crunch', so I'd probably have a 1 SP white cheddar rice cake on the side. Looking forward to other low-SP quinoa ideas from you & your readers! Love quinoa. One year ago, I quit sugar and carbs. I was so addicted. I replaced them with healthy fats and protein. Today, 60 pounds later and lighter, I don't even want them any more. Quinoa fills the pasta hole but feels so much better in my digestive system and I like the flavor better than pasta. You MUST rinse, rinse, rinse it. It's a little hard to get it wet. I put it in a small mesh strainer suspended in a pan of water, stirring to wet it thoroughly. Once it's wet, I let it soak 5 - 10 minutes and then rinse at least three times, dumping the water out of the pan and refilling. Not really crazy about quinoa but am trying to find recipes I might like using it. Will definitely try this recipe or my own version of it. Am also printing it out and making copies for my quinoa loving co-workers. I would like to make this overnight. Any idea if I could just put everything into the dish and cook it on low for 8 or 9 hours? I think someone else asked this question but no answer so far. Thanks. @vivian and @maggi - I think it would work but I haven't tried it. My fear would be that the chicken would get over cooked and dry - but it might be fine. I am sorry I don't have a better answer. This is absolutely the most delicious soup ever. I followed the directions exactly. Now I know what it supposed to taste like and next time will try using low temperature for longer to see if it turns out as good. Besides being spicy - but not too spicy as you can still taste all the other seasonings - the veggies don't turn to mush like some other slow cooker recipes. My husband thinks it smells as good as it tastes - even better maybe! This is definitely a keeper. This sounds great. I will definitely make this. 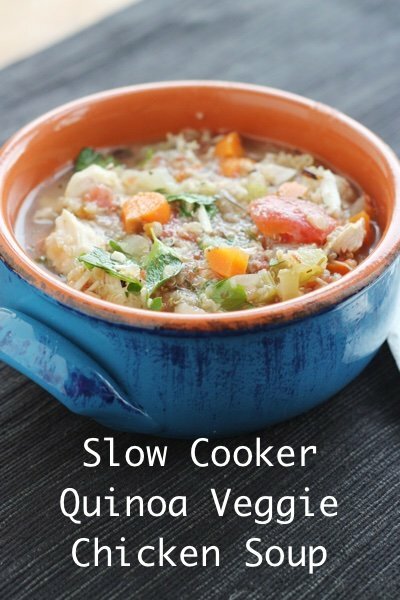 Is the chicken added to the slow cooker raw?